I can't explain how cute this stuff is. 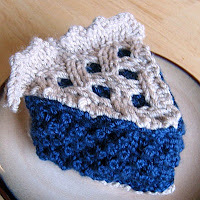 I have to knit food...NOW! I love knowing how to use double pointed needles. It's like a whole new world has opened up. 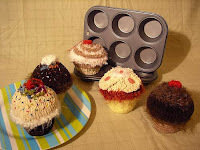 A world of knitted cupcakes and pies and ....... children dressed as CORN! Pie from PieKnits. Cupcakes are the creation of Ms. Darcy and the Baby Corn is from Lion Brand.